HPT’s VHT Series of laboratory systems are ideal for the production of metal samples for emission or X-ray spectrometric analysis, calibration standards and alloy development. 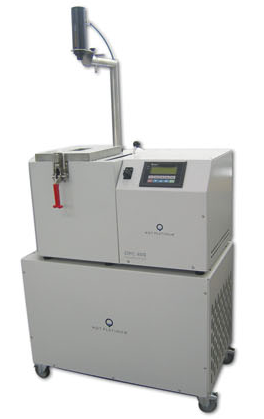 HPT’s efficient Induction Power Supply ensures thorough mixing of the metal to produce samples with a homogenous composition, that are melt and cast in a vacuum inert environment. HPT’s Laboratory Series of furnaces ensures the highest quality samples are produced. All samples are produced in a controlled environment, and the operator has full control on all process parameters to ensure consistent results. These systems are extremely easy to use. The operator places the metal to be cast into the crucible, and once the chamber is closed, the vacuum inert environment is created at the touch of a button. The metal is heated to the required temperature and once the operator is ready to cast the metal, the casting lever or automated casting system is used to cast the metal into the mould. 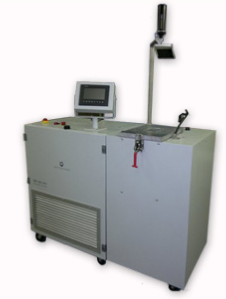 The VHT 5K is a vacuum inert melting and casting system for production of sample metal discs. With crucible capacities up to 35cc, the VHT 5K is ideal for production of small preparations. An optional external cooling system, as well as temperature control is available. The VHT 10K is a fully integrated and automated system for production of metal samples. The easy to use touchscreen provides the user with full control of the process variables, ensuring consistent results. The VHT 10K is suitable for larger melting volumes and is available with crucible capacities to 85cc. The VHT 10K also has an integrated cooling system, and therefore requires no connection to an external cooling tower or chiller unit. Automatic Casting Function: The VHT 10K is also ideal for laboratories with high throughput, as the system can be setup to be fully automated with a feature called ACF. With this feature the operator only loads the metal, and the system automatically runs through the various processes and once the sample is produced and ready to be removed from the chamber the operator is notified. All parameters are preset, and therefore each sample is produced in exactly the same way, ensuring consistent high quality results. The VHT 20K incorporates cutting edge induction heating technology that is able to reach 2500°C in 60 seconds. The VHT 20K is ideal for melting and casting high temperature metals and specialized high temperature alloys, such as Rhodium, Ruthenium, and Iridium, etc.